LONDON.- The Impressionist and Modern Art Evening Sale and the auction of The Art of the Surreal will take place on 2 February 2010 at 7pm with a pre-sale estimate of £56,505,000 to £80,805,000. The leading highlights include Gitane by Kees van Dongen (1877-1968) (estimate: £5.5 million to £7.5 million); Espagnole by Natalia Goncharova (1881-1962) (estimate: £4 million to £6 million); Homme assis sur une chaise (estimate: £3.5 million to £5.5 million) and Tête de femme (Jacqueline) (estimate: £3 million to £4 million), both by Pablo Picasso; and Nu aux jambes croisées by Henri Matisse (1869-1954) (estimate: £2.5 million to £4 million). A further highlight is a group of four works from a Private French Collection which have been in the possession of the current owners for the last 60 years, three of which will be exhibited in public for the first since the 1960s. This group is led by Mademoiselle Grimprel au ruban rouge, an important portrait by Pierre-Auguste Renoir (1841-1919) (estimate: £1.8 million to £2.5 million). Giovanna Bertazzoni, Director and Head of Impressionist and Modern Art, Christie’s London: “Impressionist and Modern art has continued to attract collectors over the last 18 months and it has proved to be a robust and stable category of art. Despite the wider economic environment in 2009, Christie’s sold 12 Impressionist and Modern works for over $10 million last year, with a total of 34 works sold for over $5 million, and 109 over $1 million. The Impressionist and Modern Art Evening Sale will offer 48 lots with a total pre-sale value of £48,320,000 to £69,110,000. Led by Gitane by Kees van Dongen (1877-1968) (estimate: £5.5 million to £7.5 million), the auction will also include works by other leading artists of the field including Claude Monet, Henri Matisse, Pablo Picasso, Vincent van Gogh, Pierre-Auguste Renoir and Edvard Munch, among others. - Gitane, circa 1910-1911, by Kees van Dongen (1877-1968) is a striking portrait by the Dutch artist which was executed at one of the most important periods of his career. Having signed a contract with Bernheim-Jeune and moved into a new studio space, Van Dongen found financial security and was able to travel extensively for the first time in 1910. From Paris he visited family in Holland before travelling to Italy, Spain and North Africa. Always having been fascinated by the cultures of these foreign lands, this direct experience was to have a profound effect on the artist and prompted one of the most fruitful periods of his career. The present work encapsulates the energy, excitement and creativity that struck Van Dongen at this time, and shows the Spanish subject with a sensual face and with blazing, vivid colour. Offered at auction for the first time by a distinguished European family, it is expected to realise £5.5 million to £7.5 million. - Espagnole, circa 1916, by Natalia Goncharova (1881-1962) will also be offered at auction of the first time having been in the ownership of a private Swiss collector since the early 1980s. 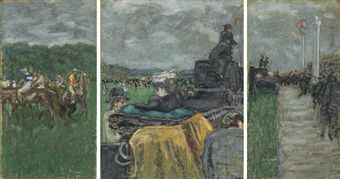 In June 2008 the artist’s Les fleurs sold for £5.5 million, establishing a world record price for any painting by a female artist sold at auction. Cubo-Futurist works executed by the artist in the 1910s are extremely rare and very sought after by the most sophisticated international collectors. 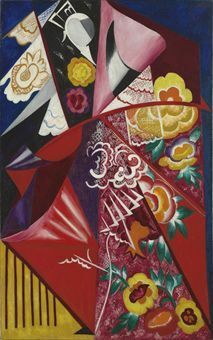 Espagnole is a spectacular picture executed during the First World War, and is an outstanding example from a series which saw Goncharova merge painting and theatre design - the two disciplines for which she is best known. The painting offers an exceptional fusion of the artist’s avant-garde and her much celebrated work for Sergei Diaghilev’s Ballets Russes. The work will be exhibited to the public for the first time since 1971 at Christie’s from 20 January to 2 February, and is expected to realise £4 million to £6 million. - Tête de femme (Jacqueline), 1963, by Pablo Picasso (1881-1973) is a portrait of the artist’s second wife whom he had married two years earlier in 1961. Jacqueline became a regular model for the artist who had by this time become internationally famous; she was an instrumental figure in protecting him from the increasing demands of his fame and reputation. The couple lived a charmed life at Notre-Dame-de-Vie, a large villa by Mougins that would provide his home for the rest of his life, and she became the most important of all his Muses and models. The present portrait has never before been offered at auction and has been in the same collection since 1981. 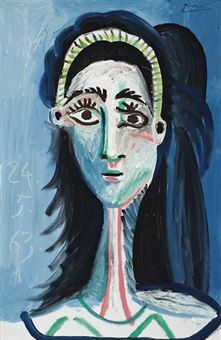 Jacqueline had a very short neck and it is said that Picasso would often humorously exaggerate its size in his portraits. It has been unseen in public since 1967 and is expected to realise £3 million to £4 million. 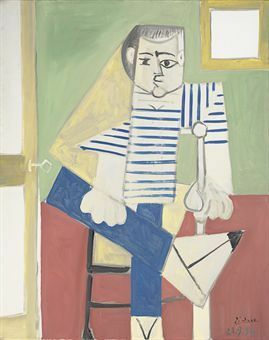 - Homme assis sur une chaise, 1956, by Pablo Picasso (1881-1973) is an imposing portrait painted soon after the artist had escaped the great attention that he was attracting in Paris and had moved to La Californie, a spacious villa overlooking Cannes. This was also the period midway between Picasso’s first two great series on earlier masters; those on Delacroix’s Femmes d’Alger and the sequence based on Velazquez’s Las Meninas. Settled at his new home, it did not take long for the proximity of the sea to have an influence on Picasso’s work, and the present portrait shows a subject with traditional fisherman’s shirt, and with a fisherman’s rugged features. It is expected to realise £3.5 million to £5.5 million. 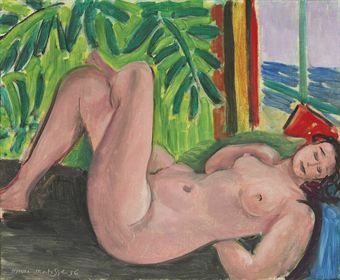 - Nu aux jambes croisées, 1936, by Henri Matisse (1869-1954) is offered at auction for the first time having been in the same Swiss Collection since 1963. An important, rarely seen work, it will exhibited to the public for the first time since 1951 at Christie’s from 20 January to 2 February. 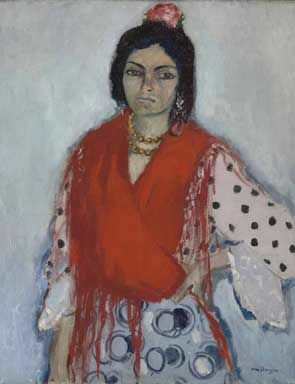 The painting was executed in 1936, near the beginning of the incredibly close relationship that Matisse shared with Lydia Delektorskaya who was a Muse, model, studio assistant and occasional confidante of the artist. During the early 1930s Matisse had created relatively few easel works and from 1935 he entered an important period of invention as he digested and condensed a range of new ideas and influences. Nu aux jambes croisés is expected to realise £2.5 million to £4 million. The auction will offer a group of four works from a Private French Collection which has been in the possession of the current owners for the last 60 years, three of which will be exhibited in public for the first since the 1960s. 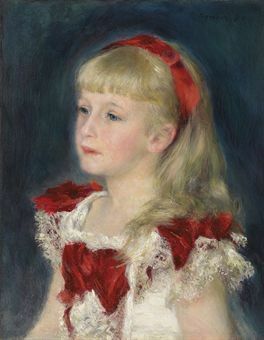 This group includes Mademoiselle Grimprel au ruban rouge, 1880, an important work by Pierre-Auguste Renoir (1841-1919) which dates to the highpoint of the artist’s portrait painting. 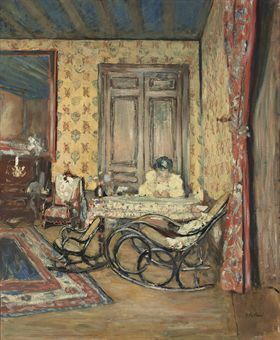 Exhibited twice during the artist’s lifetime, it portrays Hélène Grimpel, the granddaughter of Armand Grimpel, a wealthy banker who became a great patron of the artist (estimate: £1.8 million to £2.5 million). 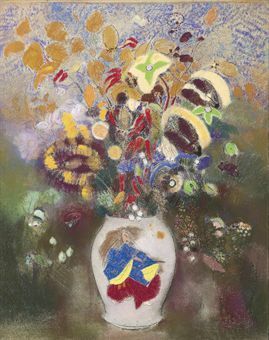 Vase au guerrier japonais by Odilon Redon (1840-1916), an outstanding pastel of monumental size, is expected to realise £1.8 million to £3 million; Les courses, Longchamp (triptyque), 1897, by Pierre Bonnard (1867-1947) carries an estimate of £700,000 to £1,000,000; Intérieur aux rocking-chairs, 1902, by Edouard Vuillard (1868-1940) which is estimated to realise £250,000 to £350,000. Further highlights of the sale include Danseuses, circa 1896, a pastel of ballet dancers by Edgar Degas (1834-1917) last sold at auction in 1989 (estimate: £2 million to £3 million); Le compotier rouge (Compotier de poires), 1925, a signature still life by Fernand Léger (1881-1955) executed at one of the most pivotal periods of his career (estimate: £1.5 million to £2 million); Zwei nackte Mädchen in flacher Wanne (recto), circa 1912-1913; Elbkähne vor gelben Haüsern, Dresden (verso), 1920, an important double-sided canvas by Ernst Ludwig Kirchner (1880-1938), each of which represents a crucial period from the development of the artist (estimate: £1.4 million to £1.8 million); Jeune femme en robe verte (Germaine Maréchal) by Théo van Rysselberghe (1862-1926) (estimate: £800,000 to £1,200,000); Casseur de pierres (Le tas de pierres), circa 1882, a masterful portrayal of stone-breakers by Georges Seurat (1859-1891) (estimate: £1.2 million to £1.8 million); Sitzende Frau, 1909, by Alexej von Jawlensky (1864-1941) which is expected to realise £600,000 to £800,000; and Bayerische Landschaft mit Fuhrwerk, circa 1918, by Heinrich Campendonk (1889-1957), one of the artist’s fullest and finest expressions of the ideal of man, animal and nature which will be sold for the first time in over 60 years (estimate: £700,000 to £1,000,000). 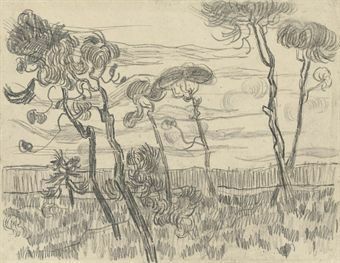 Coinciding with the exhibition The Real Van Gogh; The Artist and His Letters at The Royal Academy from January 2010, the sale will offer two works by the celebrated Dutch artist; Six Pines near the Enclosure Wall, 1889, a mesmerizing drawing of trees that was executed while he was committed to the asylum of Saint Rémy de Provence which is expected to realise £600,000 to £800,000; and The Iron Mill in The Hague, an early landscape painted in 1882, which carries an estimate of £450,000 to £550,000. The Art of the Surreal Evening Sale will immediately follow the Impressionist and Modern Art Evening Sale, and will offer 38 lots with a total pre-sale value of £8,185,000 to £11,695,000. Since 2001, Christie’s have dedicated a section of the February evening sale to surrealist art. The Surrealist movement was founded in France in 1924 with the publication of Manifeste du surréalisme by the writer André Breton, its founder and chief spokesman. He stated that the central idea was ‘to resolve the previously contradictory conditions of dream and reality into an absolute reality, a super-reality.’ Major artists associated with the Surrealist movement include René Magritte, Salvador Dalí, Max Ernst, Giorgio de Chirico and Francis Picabia, all of whom are represented in the sale. 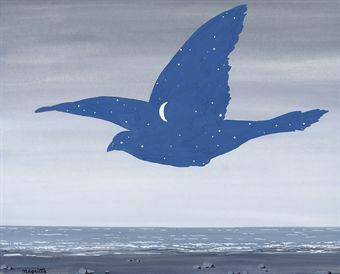 The sale will offer 7 works by René Magritte (1898-1967), including Le Baiser, 1957, a representation of the ‘Sky-Bird’, one of the artist’s most celebrated motifs (estimate: £600,000 to £800,000) and Les grains de beauté, 1965, which will be offered at auction for the first time (estimate: £500,000 to £800,000). La robe du soir, 1955, which was painted for the celebrated Belgian writer Jan-Albert Goris (1899-1984) (whose pseudonym was Marnix Gijsen) and which has since passed by descent to the present owner will be offered with an estimate of £400,000 to £600,000 and Feu-bouteille, circa 1959, which was presented to the writer on his 60th birthday having been sent to the United States in a shoe box by Magritte is expected to realise £120,000 to £180,000. 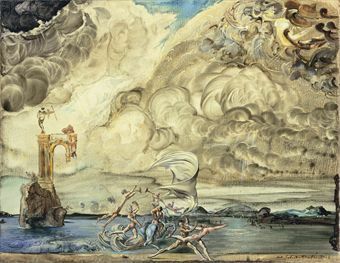 Le triomphe de Tourbillon, 1943, by Salvador Dalí (1904-1989) is one of an important group of paintings executed by the artist in the mid-1940s on the theme of obscure allegories that fuse barren landscapes, classical motifs and dancing nudes into wondrous fantasy scenes, all rendered in the manner of stage-sets for ballet. 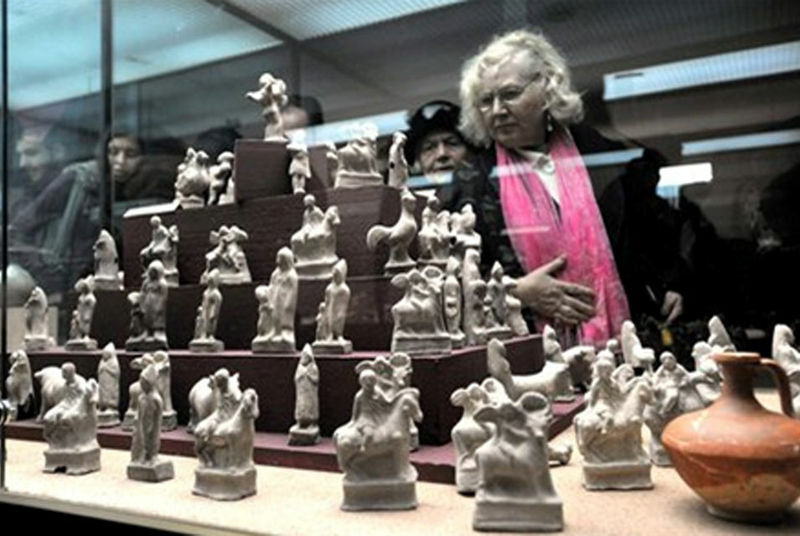 Two similar examples can be found in the Dalí Museum in St. Petersburg, Florida. Offered at auction for the first time since 1988, it is expected to realise £600,000 to £900,000. 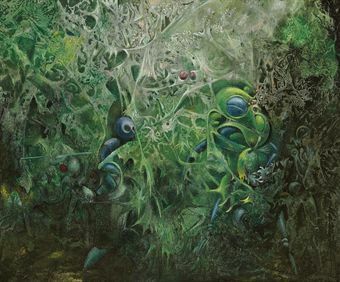 Profanation of Spring, 1945, by Max Ernst (1891-1976) is a richly detailed and bizarrely animated painting prompted by the artist’s fascination with the natural environment. It is expected to realise £700,000 to £900,000. Le tambour major de l’armée céleste, 1970, is a large scale work by the artist which illustrates his developing fascination with cosmology. Offered at auction for the first time, it is expected to realise £400,000 to £600,000. Further highlights include Nerii, an important work executed circa 1929-1931 by Francis Picabia (1879-1953) (estimate: £500,000 to £800,000); Scuola di Gladiatori, 1927, by Giorgio de Chirico (1888-1978) (estimate: £350,000 to £550,000) and Sans titre (Répondre), 1938, by Yves Tanguy (1900-1955) (estimate £300,000 to £400,000). The Impressionist and Modern Art Day Sales will take place on 3 February and will offer 258 lots with a total pre-sale value of £14,017,000 to £20,164,900. The Impressionist and Modern Art Day Sale will take place on 3 February at 2pm, and will offer 145 lots with individual estimates from £10,000 to £600,000, and with a total pre-sale value of £9,697,000 to £13,775,000. Highlights include La maison, le matin, 1930, by Henri Le Sidaner (1862-1939) (estimate: £400,000 to £600,000); Femme debout au chignon by Alberto Giacometti (1901-1966) (estimate: £300,000 to £500,000); and Julie Pissarro cousant by Camille Pissarro (1830-1903) which is expected to realise £300,000 to £500,000. The auction of Impressionist and Modern Works on Paper will take place on 3 February at 11am and will offer 113 lots with individual estimate from £5,000 to £500,000, and with a total pre-sale value of £4,320,000 to £6,389,900. Highlights include Trois femmes et amour and Buste d’homme à la pipe, both by Pablo Picasso and both offered with an estimate of £300,000 to £500,000; and La lecture (recto and verso) by Henri Matisse (1869-1954) which is expected to realise £100,000 to £150,000.